CANACONA: A tipper truck driver veered his vehicle off the road at Gulem, Canacona after he realised that the brakes of his truck had failed, eventually saving three women who were walking meters away from the accident site. Eye witnesses said that a tipper truck carrying construction material was proceeding towards Canacona at about 10 am on Thursday. There was traffic on both the sides of road, and after descending the slope at Gulem the driver of the ill-fated truck realised that his breaks had failed. 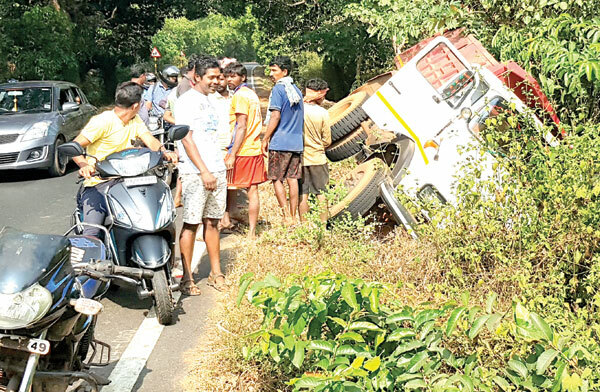 Without wasting time he veered his vehicle off the road as there were three women walking on the path of the truck meters away; eventually the truck fell on its side as there was no side shoulders or crash railing at the stretch of NH66. The women who had a close brush with death were seen shivering and the onlookers took them to a nearby temple and offered them water, sources said. People who later gathered at the accident site appreciated the vehicle driver for showing extraordinary presence of mind and saving three women from being crushed under the wheels of the truck. As the truck slowly fell on its side the driver escaped unhurt to tell the tale of how he managed to take the vehicle off the road saving three certain deaths.